A beer festival is coming up at The Angel Hotel in Whitby. 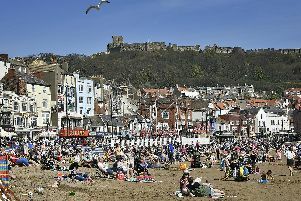 Beers from China, Australia, Brazil, South Africa and the USA, as well as the UK, will be available at The Angel Hotel in Whitby during its 12-day real-ale festival. The pub in New Quay Road will be serving a range of beers during the festival, which runs from next Wednesday (March 27) until Sunday April 7 inclusive. The festival line-up includes new, seasonal and speciality beers as well as one brewed exclusively for the festival. There are beers flavoured with blueberries, elderberries, chocolate, orange and raspberries. The overseas beers are: Contender EPA (Boxing Cat Brewery, China), Kol Schisel (Big Shed Brewing, Australia), Aggro Bear (Sunset Brew, Brazil), Asphalt Jungle (Bagby Brewing, USA) and Gypsy Mask Red (Darling Brew, South Africa). The UK beers include: Bunny Hop (Purity Brewery), Moonraker (J W Lees Brewery), Choc & Orange Stout (Black Sheep Brewery), Hen in Black (Elgood’s), Old Sea Dog (Camerons), Bitter & Even More Twisted (Harviestoun) and Topaz Gold (Adnams). Pub manager, Philip Tindle, said: “We are promising our customers a superb range of beers from overseas which have been brewed especially for the festival, together with some great beers from brewers across the UK. It will also serve three ciders from UK producers. All beers and ciders will be priced at £2.59 a pint.